Published in DA Transactions, 1939. THE REV. TREASURER JOHN FREDERICK CHANTER, M.A., F.S.A., was born in 1853, at Barnstaple, in the house now occupied by the North Devon Athenaeum, being the son of the late J. R. Chanter, who was a mayor of that town. The Chanter family has long associations with North Devon. Treasurer Chanter went to the Grammar Schools of Barnstaple and Exeter, gained an exhibition at Jesus College, Cambridge, took his degree in 1876, and proceeded M.A. in 1879. After training at Sarum Theological College he was ordained in 1880, and priested in 1881. His first assistant curacy was served at Bridport; in 1886 he was at Tisbury, and in that year was preferred to the rectory of Parracombe. At that time Parracombe had but one church, inconvenient for most of the parishioners, though now on the bypass. The new rector set about collecting funds to build a second church nearer the habitations of his flock, and never rested till the £2,000 he needed had been given him. Much of this was begged from fellow travellers 0n the Great Western Railway, who must have become well acquainted with the indomitable and persistent clergyman. In the old church Treasurer Chanter for many years retained the musicians who played in the gallery at one or two services in the year, but about 1890 he felt that people came to those services out of curiosity, and not to worship. With reluctance he then abolished what must have been one of the last of the church orchestras in the county. Soon after the Barnstaple and Lynton Railway was opened, he conceived the notion of scattering flower seeds along the sides of the track, a practice which, however reprehensible from the botanist’s point of View (though the botanist can hardly have been deceived) certainly added a novelty to the journey, and an embellishment not often imitated. On his retirement in 1916 he settled at Exmouth, and continued to be a licensed preacher of the diocese. He was made Honorary Archivist of the cathedral in 1917. 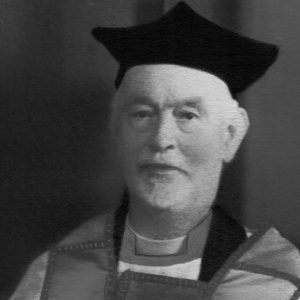 Prebendary in 1921, and Treasurer in 1929. His great love for the cathedral was shewn by the stained glass he gave for the cloister, and the shields of their official arms placed above the stalls of the dean, chancellor, precentor, and treasurer. With Prebendary H. E. Bishop, Cathedral Librarian, he provided a measure of restoration of the sedilia. He was a learned and sturdy champion of the rights, such as remained to it, of the Greater Chapter. Archaeology and history were in his breeding. In his earlier days he was a friend of Charles Kingsley, R. D. Blackmore, Stephen Hawker, and, later, of Sabine Baring-Gould. He knew all the bishops of Exeter, from the time of Phillpotts. His recollections of childhood at Barnstaple, and at Swimbridge where he was brought up, remained very vivid. His first visit to Barnstaple Fair was paid in 1847, and he saw it eighty-one times afterwards. When at Barnstaple School he walked at the head of the procession made in connection with the celebration of the wedding of the Prince of Wales and Princess Alexandra of Denmark. Reckoned among the foremost historians of Devon, with a mind adapted to acute and painstaking research, he made accuracy his first object, but to this qualification he was able to add a happy and interesting way of presenting the result of his labour. With his unfailing memory for the branching genealogical trees that flourish in Devon, he might have written, had he found leisure for it, a book on his own life and times which would have been invaluable to those who come after him. Treasurer Chanter was a member of many societies connected with this county. He joined the Devonshire Association in 1901, and was its President at the Okehampton meeting twenty years after. He served on the Council from 1903 to 1938, and was a ready and forcible speaker who never hesitated to say what he thought; nor was he a respecter of persons. Throughout his life his speech was unmistakably that of the North Devon man. His contributions to the history of Devon make a long list, and begin about 1867; they were marked by sound judgment in weighing and accepting evidence. His first paper in the Transactions appeared 1n 1903, the subject being R. D. Blackmore and Lorna Doone. When the Association visited Lynton in 1928 Treasurer Chanter showed some of the places he and his brother had been able to identify with those mentioned in that great romance; though he agreed that the author’s descriptions were not photographic. Other papers were: Parish clerks of Barnstaple (1904), Rude stone monuments of Exmoor (with Mr. R. H. Worth) (1905), Parishes of Lynton and Countisbury (three papers) (1906), Swainmote courts of Exmoor (1907), Christianity in Devon before 909 (1910), Exeter Goldsmiths’ Guild (1912), Extracts from the leger book of the Abbey of Buckfast (1913), St. Urith of Chittlehampton (1914), Barnstaple Goldsmiths’ Guild (1918), Charles, Prince of Wales, at Barnstaple (1914), Devonshire Place-names (parishes) 1919, Beginnings of Crediton (1923), Celtic Devon (Presidential Address) (1926), Borough of Northam (1927) and Custos and College of the Vicars’ Close, Exeter (1933). In 1907 he became editor, at first with other helpers, but afterwards working by himself, of the Reports on the Church Plate of the diocese of Exeter, a great work which was completed with the sixteenth Report in 1928. He served on many committees of the Association, and was a very capable chairman. Among these committees was that of the Parish History Section, of which he was an original member; he filled its chair from 1930 to 1935. He was responsible for the excavation of several barrows on and near Exmoor, a district which has otherwise been neglected; and he was the victim of the Daily Mail’s amazing report that from one of these barrows he had obtained more than three cart loads of stone implements, a report that brought him so much correspondence as to cause him to adopt the defence ‘gone away, no address‘. Perhaps the contribution to the archaeology of Exmoor which pleased him most was his discovery, in 1913, of the Winsford inscribed stone. He was a frequent contributor at one time to Devon and Cornwall Notes and Queries, and wrote for the Exeter Diocesan Architectural and Archaeological Society. Several of his papers were republished in book form; other books by him included The Bishop’s Palace at Exeter (1932); The Church of St. James, Swymbridge (1935), and The Life and Times of Martin Blake (1910). Failing health had reduced his activities in the last few years; though he was able to attend the meeting at Barnstaple in 1938, he was not often seen in Exeter afterwards. He married Miss Rose Thompson, daughter of the Rev. William Henry Thompson, rector of Exmoor; and on his death at Exmouth, which happened on the 16th July, 1939, he left a widow and an only daughter, Mrs. Nind.